It is best to prevent tick bites through avoidance or removing ticks right away before they have time to transmit disease. 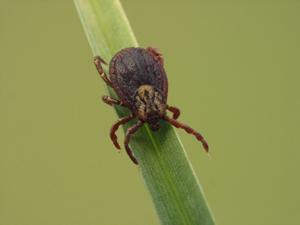 The process of disease transmission requires a minimum length of time for the tick to feed, which means that if the tick is removed promptly, then the host will not get the disease. You can keep your pet on a trimmed lawn and on-leash when in the woods. It is recommended to look for ticks by combing through your pet’s fur when he/she comes back from playing in wooded areas or areas with long grass. A tick can be removed at home with tweezers or by a technician at our clinic. There are spot-on and oral products available for dogs and spot-on products for cats that are available by veterinary prescription. All tick products should still be combined with tick avoidance strategies. Coventry Animal Hospital tests for tick-borne diseases at the time we perform a yearly blood test to screen for exposure to heartworm. Tick prevention is safe to use even in the event that a dog’s blood sample shows that it has been exposed to a tick-borne disease.